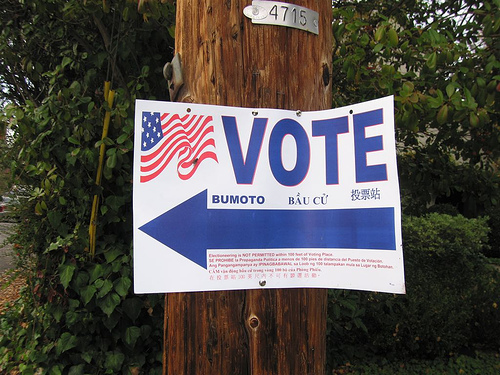 We once wrote about reasons to not vote, at least from an economist’s perspective. Since a single vote almost never alters an outcome, what’s in it for the voter? In other words, we do vote out of self-interest – a conclusion that will satisfy economists – but not necessarily the same self-interest as indicated by our actual ballot choice. For all the talk of how people “vote their pocketbooks,” the Swiss study suggests that we may be driven to vote less by a financial incentive than a social one. It may be that the most valuable payoff of voting is simply being seen at the polling place by your friends or co-workers. Why do people vote? We argue that social image plays a significant role in explaining turnout: people vote because others will ask. The expectation of being asked motivates turnout if individuals derive pride from telling others that they voted, or feel shame from admitting that they did not vote, provided that lying is costly. We design a field experiment to estimate the effect of social image concerns on voting. In a door-to-door survey about election turnout, we experimentally vary (i) the informational content and use of a flyer pre-announcing the survey, (ii) the duration and payment for the survey, and (iii) the incentives to lie about past voting. Our estimates suggest significant social image concerns. For a plausible range of lying costs, we estimate the monetary value of voting “because others will ask” to be in the range of $5-$15 for the 2010 Congressional election. In a complementary get-out-the-vote experiment, we inform potential voters before the election that we will ask them later whether they voted. We find suggestive evidence that the treatment increases turnout. But the question was which is most anti-social, not which choice messes up the election most. With regards to which behavior is most damaging to the election I agree with you. I just want everyone to know that I voted in the poll. Is there a sticker or something that I can wear so everyone I meet today can know that I voted? No, but I've given you a thumbs up. Enough social reward? I think there are a lot of individuals who actually do vote because they think it matters. Interestingly enough, these same individuals will use strategy to try and influence the outcome. For instance, the only year that I was able to convince myself to vote (2012), my mother (who is a stong opponent to Barak Obama) said to me, "You are voting this year, right?" I acknowledged and said that I would like to vote for Ron Paul because I felt like he had some fresh ideas and I wanted to see what he could do. Her response went as follows, "You cannot vote for Ron Paul, you need to vote for Romney. If you vote for Ron Paul you are helping Obama get elected because he can Ron can't win and he is stealing votes from Romney!" This was really interesting to me, because I always thought we voted to support the election of our preferred candidate... I had never dreamed of casting a vote for a candidate that I didn't like, just to prevent another candidate from getting elected. I don't think I'm going to vote anymore. The first past the post electoral system in the US, UK and some other countries exacerbates this troubling scenario: a vote for anyone but the winner is wasted. There are alternative electoral systems, though. Here in Ireland for parliamentary elections the voter is presented with a list of all candidates and asked to list them by number from 1 (first preference) right down to the last (the candidate you least want to win). If you voted for a minority candidate who did not win a seat, your vote is not just thrown away. Instead your second preference is counted and added to the votes of that candidate. As the votes are counted, at a certain point it would be a mathematical impossibility for Ron Paul to win. His votes would then be examined for their second place preference, and those would be added to Romney or Obama. In that case you could make a stand for a minority candidate, showing the political system your true political preference, while also supporting your second preference of Mitt Romney: you are not forced to vote for Romney just to avoid Obama. You can even spread your votes among several parties. Sam, you did the right thing by voting for who you wanted. We will never get better candidates if people limit their choices. Everyone is mad at our government, but no wants to make the effort to get new people elected. No matter what anyone says no vote is wasted unless you waste the opportunity to vote. Stay the course, I have been voting independent for thirty years and proud of it. Hopefully people will learn we create our own choices. I think voting with ones pocketbook could mean that consumers make choices about what to purchase and that counts as a vote for what producers make. Or that fundraising and lobbying are more effective with a single vote. It could, but it's also used to assert that people vote for their immediate economic interest, i.e., against tax increases. I'm wondering whether economists have ever looked into the concept of collective action. "I" can't get the school bond passed, but together "we" can. or "I" can do nothing, and "they" will do it for "me". I have given up voting for candidates and vote only on measures. I doesn't make a bit of difference which side wins. The victor, no matter how honest and principled at the beginning, is going to become just as corrupt and self-serving as the existing pols already are. They're going to rob me either to help the banks, corporations, oil companies, etc. or to help the lazy. My philosophy is that if you want to be a do-gooder for either the rich or the poor, use your own money. Don't take it by force from others. So what does it mean that I pretty much always vote but generally eschew the "I voted today" sticker? : - ) I don't like the signal it gives like I'm trying to be the neighborhood goody two shoes. I grew up in a fairly rural part of WA state and my dad was president of the local school board for a time. During that time our school district set the state record for the most consecutive failed school levy votes. Year after year levies for new buses, bus repair, textbooks, school construction/repair, libraries, you name it they were always voted down. The school bus fleet was ancient. I was on an old bus that actually caught fire while full of students. Anyway during the record levy losing streak, several of them failed by SINGLE DIGITS. This in a pool of about 3,000 to 3,500 registered voters. The closest failure was by something like 2 or 3 votes. So I guess I'd argue to the contrary. If you lived in north Kitsap at that time and you and your buddy didn't vote, you actually DID swing the election. I'm a big freakonomics fan, but the assertion that you shouldn't vote because it doesn't matter has always seemed a little dumb. I think some overthinking has to happen to get to that conclusion. Obviously if one person as an individual thinks their vote doesn't matter, how many others feel the same way? Lots. In a vacuum, if I can guarantee that everyone else votes except me, well then sure my vote probably doesn't matter. But that's not reality. Voting gives positive self esteem. Wether or not anybody knows. Why would person A try to make person B feel guilty if person B did not voter? What does person A get out of that? I vote because it's a signal - to the politicians. Sure, in who gets the job, a 51-49 win counts as much as a 90-10 one. But if, say, in successive elections the margin goes from 90-10 to 51-49 (or vice versa), you can bet that the politician concerned gets the message loud and clear. Sure, my vote is a pretty small signal on its own - but it's mine, and I don't want to rely on anyone else to send it. I vote because it's a civic duty. There are some things you don't measure in dollars & cents, and this is one of them. Last & least, I vote because (here in Australia) it's compulsory. I remember being surprised at learning Mr. Levitt's reasoning on not voting -- essentially, that it is pointless, since 1 vote virtually never decides nationally elections. Except when it does. I see his point, really, but I'll bet the folks on Broward County Florida (hanging chads, Bush v. Gore, etc. etc.) felt like their votes mattered. In the end, that national election WAS decided by one vote -- one the Supreme Court. At that time, I worked at an insurance company, and I asked one of the actuaries about the seemingly unimaginable odds of the results in that election. He was unimpressed. "Any outcome is as likely as any other outcome. So why not? Especially in elections where two sides start with 40% and spend 3 years and hundreds of millions fighting over a handful of persuadable voters. When you consider the number and frequency of national elections, now that I think about it, the remarkable thing is that this outcome isn't MORE common." Add to that: An election needn't be separated by just ONE vote: as long as the two sides are within the parameters of a recall, they could be separated by hundreds of votes, depending on the voting jurisdiction.